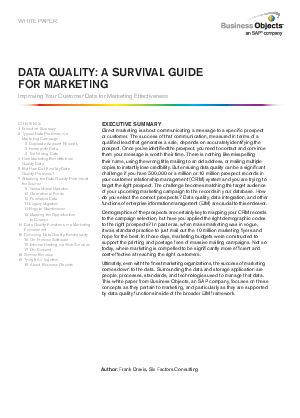 In this paper, Frank Dravis, Six Factors Consulting, discusses how even with the finest marketing organizations, the success of marketing ultimately comes down to the data. Surrounding the data and storage application are people, processes, standards, and technologies used to manage that data. This white paper from SAP BusinessObjects focuses on these concepts as they pertain to marketing, and particularly as they are supported by data quality functions inside of the broader EIM framework.